The Harmony of Spheres is a symphonic space of sights and sounds. Photo courtesy of Museum of Mathematics. EVER wonder what the MIT student, RPI grad, middle school math teacher, or Bronx Science sophomore in your life needs? Of course, you do! In its 19,000 square-foot space off Madison Square Park, MoMath offers 30 exhibits that encourage hands-on participation from visitors with various levels of mathematical skill and knowledge. The Hyper Hyperboloid is a chamber walled by vertical cords in which you sit on a revolving chair while strings form amazing patterns around you. 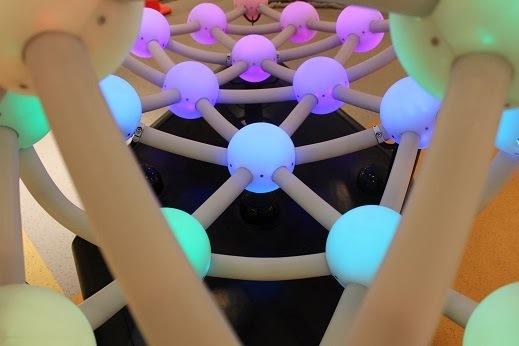 Touch glowing spheres to make and see music exploring harmonies, major and minor chords while patterns of colored lights move through space. Find out how to make tracks and what it takes to predict the outcome of a good business transaction … More shortly. Visit http://www.momath.org/ to learn more about the Museum of Mathematics.